‘Tis the season for award ceremonies, and on Monday the American Library Association (ALA) announced the top books for children and young adults at its Midwinter Meeting, held this year in Atlanta, Georgia. We reported on Tuesday that Kelly Barnhill took top honors with the Newbery; read who else was recognized for their contributions to children’s literature over on the Fine Books Blog. UPDATE: Matt de la Pena was awarded the 2016 Newbery Medal 2016, and Christian Robinson received a Caldecott Honor. CJ and his grandmother board the Market Street bus after church every Sunday, and spend the afternoon working in the soup kitchen of a homeless shelter. One day, the boy wonders aloud why his family doesn’t have a car or an MP3 player, and his wise and patient grandmother responds with encouragement, gentle humor and love by showing CJ that there is beauty even in the muddy and mundane city streets. Brooklyn-based author Matt de la Peកa (A Nation’s Hope: The Story of Boxing Legend Joe Louis) captures the child’s inquisitive spirit as well as the time-worn perspective of an older generation with short, snappy sentences that convey just enough detail about class inequality without weighing the story down. (When CJ and his grandmother board the bus, Peកa’s ‘They sat right up front" recalls Rosa Parks and the civil rights movement in one simple sentence, and it’s perfect. ) San-Francisco native Christian Robinson (Smallest Girl in the Smallest Grade; Josephine) expertly captures the charm and vibrancy of the City by the Bay with illustrations done in bright acrylic paint and collage. This celebration of life’s simple gifts and reminds us that what matters most isn’t the acquisition of stuff, but the time we spend with each other. Already read Flora and Ulysses? Check out Leroy Ninker Saddles Up, the latest offering from National Ambassador for Young People’s Literature where a lonely wannabe cowboy falls in love with an old mare named Maybelline. DiCamillo fans will recognize many characters from her Mercy Watson series who return here for some good old-fashioned horsing around. Nicole Claire looks at her favorite Caldecott and Newbery Medalists of 2015. “Flora and Ulysses: The Illustrated Series,”by Kate DeCamillo, illustrated by K.G. Campbell; Candlewick Press, $17.99, 240 pages, ages 9-12. In this adorable ode to superheroes, comic-book aficionado Flora sets on a series of adventures with a witty squirrel appropriately named Ulysses. DeCamillo’s humor (and wonderfully rich vocabulary) is perfectly matched by comic book artist’s K.G. Campbell’s black and white illustrations. Readers will adore that this quirky action-packed novel matches a sensitive, sophisticated story. “Doll Bones,” by Holly Black; Margaret K. McElderry Books, $16.99, 256 pages, ages 10-14. “The Year of Billy Miller,” by Kevin Henkes; Greenwillow Books, $16.99, 240 pages, ages 8-13. “One Came Home,” by Amy Timberlake; Alfred A. Knopf, $16.99, 272 pages, ages 9-13. “Paperboy,” by Vince Vawter; Delacorte Press, $16.99, 240 pages, ages 10-14. “Locomotive,” by Brian Floca; Atheneum Books for Young Readers, $17.99, 64 pages, ages 4-10. This year’s Caldecott winner is a picture book rich with sensory details about America’s first trans-continental railroad. The rolling text mimics the turning of the wheels and the rumbling of the train down the track. Sumptuous images will easily captivate young readers, despite the book’s length. “Journey,” by Aaron Becker; Candlewick Press, $15.99, 40 pages, ages 4-8. “Flora and the Flamingo,” by Molly Idle; Chronicle Books, $16.99. 44 pages, ages 4-8. “Mr. Wuffles!” by David Wiesner; Clarion Books, $17.99, 32 pages, all ages. The release of a new film adaptation of Fitzgerald’s classic novel has reignited a mania for all things Gatsby. And why not? The story illustrates a prosperous, glamorous, yet sometimes garish, period in American society. Today, we look at the creation of the first award for children’s literature, which was the same year in which Fitzgerald set The Great Gatbsy. While Fitzgerald described the cosmopolitan world of flapper culture set to decadent jazz music, American publisher and renowned admirer of children’s books Frederic Melcher commissioned the first Newbery Medal. Melcher named the award after the eighteenth-century British bookseller and printer Jon Newbery because he is regarded as the first dedicated printer and publisher of children’s literature. 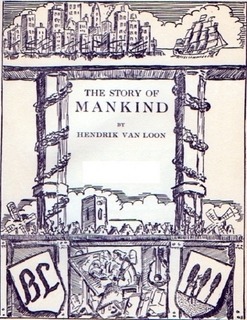 The first Newbery medal winner was a non-fiction history book called The Story of Mankindby Hendrik Willem van Loon (Liveright). In the 1920’s this book was considered the authoritative children’s resource on 5,000 years of history. Like The Great Gatsby, the Newbery Award isa uniquely American institution, since only authors contributing to American children’s literature and published in the United States by an American publisher are considered for the prize. Source: Hazard, Paul. Books, Children & Men. (M. Mitchell, Trans. ).Boston: The Horn Book Co., 1944.